The perfect way to display your prize plants. 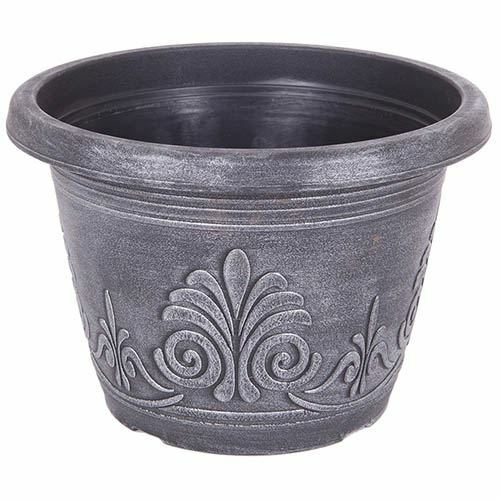 This classic looking, long-lasting, sturdy mid-size plastic planter has a simple, classic design and is hand wash painted silver over black to create a contemporary looking pot, perfect for housing a whole host of flowers, trees, shrubs and bulbs. The sleek, contemporary design will fit any garden and they’re particularly great when double up for pairs of standard plants up to 90cm tall, such as bay trees, olives, phoneix plams, or even buxus. Place either side of doorways, pathways and patios to create an elegant, contemporary feel.